Skype for Business (formerly known as Lync) are enterprise instant messaging clients provided by Microsoft to be used with Microsoft Lync Server or Lync Online / Skype for Business Online available with Microsoft Office 365. Lync provides the infrastructure for enterprise instant messaging, presence, VoIP, ad hoc and structured conferences (audio, video and web conferencing) and PSTN connectivity through a third-party gateway or SIP trunk. Skype for Business and Lync supports communications and instant messaging with external users, who are either Skype for Business user in another organization or domain, or personal Skype users and Windows Live Messenger users. This feature is commonly known as federation. The support for external communications and public instant messenger connectivity has to be enabled in Skype for Business Admin Center. This tutorial shows you how to do just that. Note that this tutorial is geared towards Office 365 and Skype for Business Online or Lync Online, whereas on-premise Skype for Business Server or Lync Server will involves other additional steps to enable federation After enabling external communications, users in your organization can add Skype for Business or Skype users outside your organization to their list of Skype for Business contacts. Login to Office 365 admin center. On the left navigation pane, expand ADMIN tree, then click or tap on Skype for Business or Lync to open Skype for Business admin center or Lync admin center. In Skype for Business / Lync admin center, go to Organization. Then go to External communications tab. Off completely – if you choose this setting the public instant messaging connectivity with Skype is also unavailable. On except for blocked domains – Recommended if you want to allow users to access and communicate with most people. On only for allowed domains – Choose this if you want to allows users to communicate with users from approved organizations but block everyone else. Under public IM connectivity section, tick and enable the check box for Turn on communication with Skype users and users of other public IM service providers if you want to allow users to communicate with personal or private Skype users (or Windows Live Messenger users through integration with Skype). Optional: Define your blocked or allowed domains if you wish. Note that you must define the allowed domains if you choose “On only for allowed domains”, otherwise users won’t be able to communicate with anybody from outside the organization. Click or tap on save button at the bottom of the page. The Skype for Business or Lync users you’re communicating with must also allow communication with your domain in order for the communication to be established. 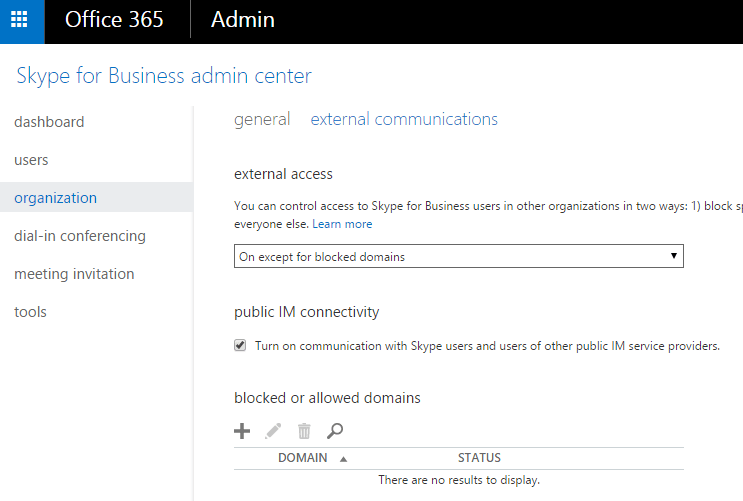 In addition, only Skype for Business features that are enabled in both organizations are available when you’re communicating with someone in a federated domain. If the external access setting is changed from “On only for allowed domain” to “On except for blocked domain”, the domains that are listed won’t be kept. Not all functionality are available when communicating with Skype users (who also must sign in with a Microsoft Account or Windows Live ID). For Lync or Skype for Business federation and external communications to work, two SRV records and two CNAME records need to be configured in the DNS for the domain as listed below.